After almost 3 years, the Academy closed its doors for good on August 26th, 2016. That doesn't mean I'm not here to help you, though! 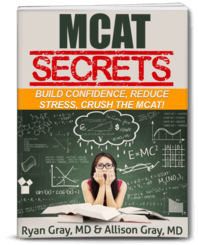 I'm continually learning new ways to help premed students like yourself. There are several ways to learn what it takes to get into medical school. Podcasts have and will always be the cheapest (they're free) way to get the best info on how to successfully navigate your premed path. Check out all the podcasts we have currently by going to Meded Media! I read a lot of personal statements! I know what is good and what is not. There is an art to writing a good personal statement. Don't rely on another premed or medical student to tell you what is good. Check out everything I can do here. Medical School Interview Course - Check out this video course for a cost-efficient way to self-study the interview. Anytime Mock Interview Platform. This new platform allows you to do a mock interview anytime, anywhere. You're recorded so you can watch yourself, take notes, perform assessments, and even share your video with mentors, friends, and family. One-on-One Interview Prep - This is the most customized experience because I'm on Skype with you, one-on-one, giving you direct feedback on your answers. Some advisors work with students on an hourly basis for application prep. For you to put forward your best application, you need more than an hour or two of my time. I have worked with students for almost a year before they applied, making sure that everything for their application was ready to go. Applying early with a polished application is the best way to ensure your best possible chance of getting an acceptance. Check out how I can help you prepare for your applications here.